Mike Coe & Lizzie Stoodley's ultra low energy eco-build in Worcestershire.  No space heating of any kind  No boiler, no wood stove, no heat pumps.  Super-insulated, triple-glazed, thermally massive.  exceeds it by a factor of three (heat demand 5kWh/m²/yr). ...Uses neither mains water or drainage, nor the energy required to deliver them.  Intelligent use of renewable energy makes the house carbon negative.  Obtains its servicing almost entirely from the land on which it stands, giving it a tiny environmental footprint.  Although different to a conventionally serviced house, life in it is designed to be every bit as good. March 2017:  Mike & Lizzie have left the Autonomous House. It was a remarkable project to take on  a house designed to tread as lightly on the surface of the Earth as possible. 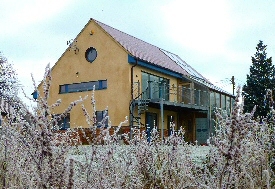 And it was successful, receiving awards, and being described as Britain's most energy-efficient private dwelling. But for a whole variety of resons, including the lure of a new challenge, we have sold the house. This means that we have no further connection with it, and cannot offer tours to visitors. This website, which documented the project from concept to completion, will remain here for information only. The Autonomous House Video Tour. A short video tour of the house, with the emphasis on explaining the autonomous features. If you weren't able to visit, then this is the next best thing! May 2012  Jan. 2013: Reaping the Rewards? Click here to read about the Technical and Energy Efficiency Features. Click here for Style and Interiors, to see why it's a wonderful house to live in. Click here for the Directory  who designed the house, built it and supplied materials. Click here to go to the start of the photo diary, which documents the entire project in pictures. To send a message please type the address into your email program.